James and Elizabeth Beckett acquired the property (1, p. 7). 1784  James Crawford obtained 110 acres from the Becketts (1, p. 7). 1802  James Crawford sold the property to Thomas Baynard (1, p. 7).
?  Ephraim Mikell purchased the parcel from Thomas Baynard (1, p. 7). 1809  Ephraim Mikell died and willed the plantation to his son, also named Ephraim Mikell. The plantation was referred to as Crawford's in Mikell's will (1, p. 7). The house was probably constructed for William Archibald and Hess Marion Waring Smith Mikell. Perhaps even before William's father, Ephraim, had legally willed the plantation to his son. The house is frame construction in the T-shaped plan (1, pp. 5, 7). 1838  Ephraim Mikell II left Crawford Plantation, and an adjoining parcel known as Davants, to his son William Archibald Mikell (1, p. 7). 1840  William Archibald Mikell died and his wife Hess inherited her husband's estate (1, p. 7). 1847  William James Whaley purchased the combined 490 acres of Crawford Plantation and Davants from Hess for "fifty-five dollars and an acre of high land" (1, p. 7). 1861  The Whaley family evacuated Edisto Island. Family tradition holds that after the Civil War, the Crawford Plantation house was occupied by two Freedmen's Bureau teachers (1, p. 8). Circa 1866  William James Whaley returned to the plantation and began to cultivate cotton using wage labor (1, p. 8). 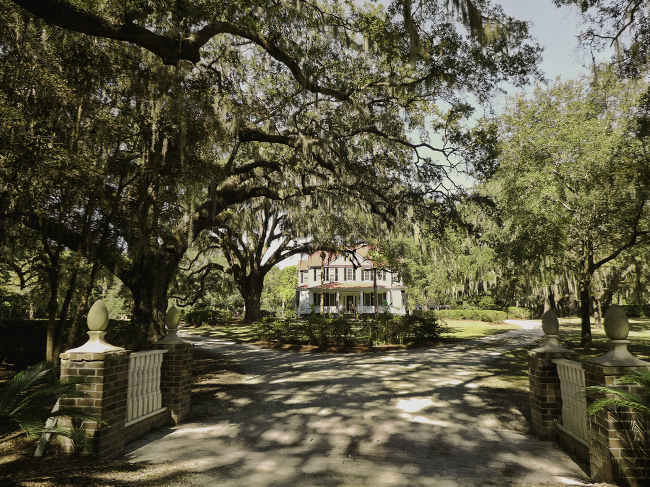 1888  William James Whaley passed away and son William James Whaley Jr. inherited Crawford Plantation (1, p. 8). 1922  After the death of William James Whaley Jr., his widow and three sons moved to Charleston and the house at Crawford Plantation was left vacant (1, p. 8). 1945  The Whaley family sold the plantation to I.C. Tavell (1, p. 8). 1993  James A. and Susan B. Rice of New York were owners of record (1, p. 4).